The long Easter weekend is the perfect time to shop for Spring Summer 2017 gear. Here at Apache, we’re delighted to unveil four bold and brilliant smart casual shirts by Guide London, brand new for the #SS17 season. Our partnership with Guide London goes back years — we’re huge fans of their quirky, creative smart casual shirts, jackets and coats. These latest shirts are as eye-catching as you’d expect from the famously sharp London brand. All the shirts are semi-tailored and in a wide size range, ideal for many different body types. This week, grab a special 10% discount on all Guide London clothing with our offer code GUIDE17 . These shirts are all limited edition for this summer only! 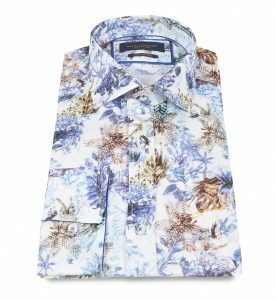 Get that “under the sea” look for Spring Summer 2017 with this gorgeous Guide London smart casual shirt. Part of their famous Premium Collection, it’s constructed with luxurious 100% cotton sateen for a gorgeous handle. The ocean floral sateen print features camouflaged turtles, fish, and coral, for a colourful and vibrant feel. The cut away collar is an interesting design choice, and we simply love the electric blue cuff lining. Perfectly at home with a blazer, smart jeans, or semi-tailored shorts. This beautiful “hand drawn” floral print shirt is quite simply a work of art. Featuring miniature flower buds on a white background and indigo blue lining (not shown in pic.) The cotton stretch fabric is ideal for athletic gym boys seeking a snug fit. Guide London throw in some finer details: mitred cuffs, a concealed button down collar, and a thin caramel piping under the placket. 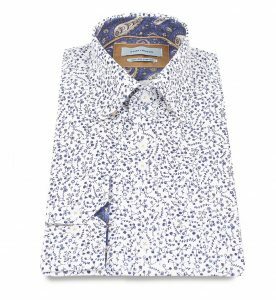 This smart casual shirt breaks from the floral theme of Guide London’s SS17 collection, sporting instead a fine-pattern “tile print.” The shirt is constructed with pure sateen cotton, a lustrous yarn woven like traditional satin. There’s a smart button down collar with a 2-button fastening, giving you a nice tight shape around the neck. The powder pink cuff and collar lining adds a splash of colour; so does the double stitch detail inside the collar. Semi-tailored shirts like this are very popular at the races, or for a nice anniversary meal. Spot the cannabis leaves on this cheeky number! 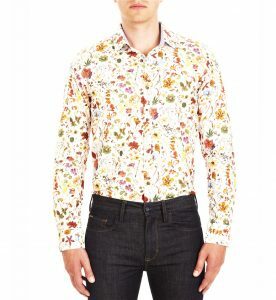 Featuring a medley of plants and flower buds on a soft Ecru white background, this vibrant print shirt really leaps out. The brown buttons have a “bone” look which complements the natural tones of the fabric. Like all of Guide London’s shirts, the semi-tailored fit brings out a complimentary shape in most sizes. 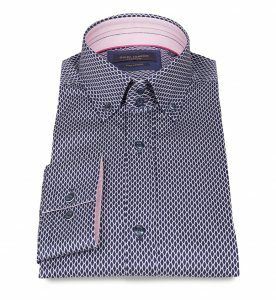 Remember, these smart casual shirts are LIMITED EDITION for Spring Summer 2017! Use our special offer code GUIDE17 at online checkout for a 10% Easter discount!